Clarisonic Mia 1 Gentle Sonic Cleansing System White 1 Speed Facial NEW IN BOX! 2- NEW Clarisonic LUXE Satin Precision High Performance Contour Brush Heads. The NEW Mia Smart 3-in-1 Connected Beauty Device is Smart Skin Care. Cleansing - Remove makeup 6x better than hands alone. After 1 week, skin appears more radiant, glowing, and smoother. Skin feels softer and more refreshed. Skin renewal cleanser gently exfoliates dead skin from your face. Perfect for all skin types to give a youthful complexion that you can flaunt. Scent: Fresh. Clarisonic Refreshing Gel Facial Cleanser 4 oz Tube NEW~. Condition is New. Shipped with USPS First Class Package. 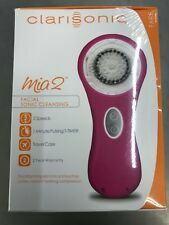 New Listing2 Clarisonic Deep Pore Brush Head for Mia Pro ARIA Plus Mia Fit Mia 2 and Mia 3. Clarisonic Replacement brush head - ACNE CLEANSING - SAFE FOR ACNE PRONE SKIN. 1 in box. Condition is New. Shipped with USPS First Class Package and shipped free to you the buyer. 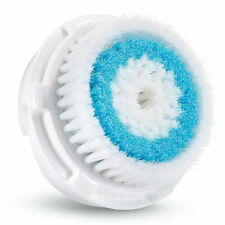 Clarisonic Replacement Brush Head For Deep Pore Skin. Condition is New. Shipped with USPS First Class Package. Condition is New. Skin is softer, smoother and more beautiful. Mia 2 Cleansing Brush. Sensitive Cleansing Brush Head. Refreshing Trial Size Gel Cleanser, 1 fl. Size: 1 brush head. Skin/hair type: Oly skin, large pores or hard to reach areas of the face. Targeted area: Face. Improves absorption of creams and serums. Quantity: 1. Clarisonic Smart Profile White Kit including extra brush. Replacement 2 brush heads for sensitive skin. Brand new. NEW CLARISONIC GENTLE HYDRO CLENSER 6 OZ . Contains algae, aloe vera gel and sucrose cocoate as key ingredients. Scented with cucumber and acts as a full body hydrogel. Gentle Radiance Foaming Milk. Full Size - Sealed. B rand new and factory sealed. Fits MIA 1-3, Alpha Fit, PLUS, Smart Profile. Not used but box has been opened. Clarisonic Mia Smart Sonic Cleansing Face Brush Open Box. Since open box being sold as used. Shipped with USPS Priority Mail. Clarisonic Mia. Condition is very lightly Used, charges and operates like New. Has monogram on back and attempted to remove it but it won’t come off, doesn’t effect the performance. Includes carry case, charging dock and cord, one new deep pore replacement head, and 3 new regular replacement heads. Shipped with USPS Flat Rate Priority Mail. Up for grabs is a beautiful rose design Clarisonic Plus, charging cradle, new and sealed Gentle Hydro cleanser, and 4 new and unused brush heads: one radiance brush head, one sensitive brush head, one deep pore brush head, and one spot therapy body brush head. This Clarisonic was opened, and the batteries replaced with top of the line Panasonic Eneloop, guaranteed for 2100 charge cycles. It was sealed with marine epoxy and housing grade silicone, both water and mold proof. This Clarisonic has been tested and works beautifully. Holds a charge, works in all 3 facial modes and both body brush modes. However, nothing can hold a charge indefinitely, so it is still recommended that you fully charge it prior to first use. 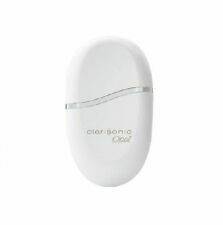 Clarisonic is sonic skin cleansing system for healthy, beautiful skin. Make skin softer, smoother and more beautiful. Just open the box but never used. Up for grabs is a white Clarisonic Plus, charging cradle, new and sealed Gentle Hydro cleanser, and 3 new and unused brush heads: one radiance brush head, one normal brush head, and one deep pore brush head. Clarisonic brush heads are expertly engineered for a specific skin type or skin concern and are optimally designed to work at the precise frequency of the Clarisonic devices. %100 Authentic. CLARISONIC - REFINING SKIN POLISH - 2 FL OZ. Condition is New. Shipped with USPS First Class Package. Includes white Mia in good used condition and new and unused normal brush head (does not have plastic cover). Does not include anything else, hence the low starting bid. Chargers are available through Clarisonic and here on eBay. This Mia has very minor signs of use, see pictures, good used condition. The battery has been tested, and it charges and holds a charge well. However, as with any Clarisonic, it is still recommended that you let it charge fully prior to first use. Gel Foaming Cleanser is pH balanced. Gentle cleanser, will not over-dry skin. Cleanser is Fragrance Free. All Products are fresh and new. Reduce the appearance of Large pores. Rinse your face thoroughly. Natural botanical ingredients combined with kaolin and bentonite clays gently remove impurities from pores to reveal smoother, softer looking skin. Includes 2% hydroxy acid to help remove dead skin cells and detoxify pores. Clarisonic Opal Replacement Tips - Count of 4. New in package -Shipped with USPS First Class Package. Clarisonic 3 Brush Heads Sensitive-Delicate-Normal New. Condition is New. Shipped with USPS First Class Package. Clarisonic Replacement Brush Head For Delicate Skin Brand New. Condition is New. Shipped with USPS First Class Package. 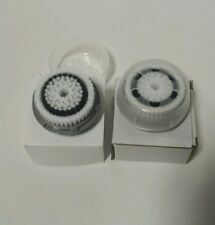 Clarisonic Brush Head Twin Pack. Condition is New. Shipped with USPS First Class Package. CLARISONIC Sensitive Face Brush Head with Cover $27 Value New NWOB!!! You are bidding on a brand new Clarisonic Sensitive Face Brush Head with plastic cover. It is compatible with Clarisonic brand sonic cleansing brushes such as the Mia, Mia2, Mia Fit, Mia Prima, Mia Smart, etc. It is new without box. These brushes retail for $27. Happy bidding! Clairsonic Mia. Condition is Used. Shipped with USPS Priority Mail. Clarisonic Mia 1 Face Cleansing Brush with New Brush Head! 2 Clarisonic Deep Pore Brush Head for Mia Pro ARIA Plus Mia Fit Mia 2 and Mia 3.